The Culinary Ability: Food Preparation Award at SCQF level 4 is a practical qualification that provides a foundation for individuals who aspire to work in professional kitchens. The award focuses on instilling high levels of food hygiene and workplace health and safety; while developing the practical skills, knowledge and understanding required to identify, handle, prepare and store a wide range of food products. This award covers areas such as: receiving and storing goods in a catering environment; selecting, weighing, measuring and preparing ingredients for future use; preparing ingredients for future use in a variety of dishes; assisting with the preparation of dishes for cooking and/or finishing; assisting with the completion and preparation of a variety of dishes; cleaning and disinfecting work areas, tools and equipment in a catering environment; and working effectively in a catering environment. 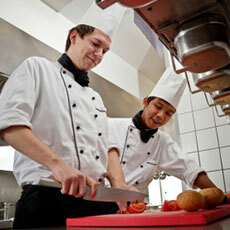 The Culinary Ability: Food Preparation Award at SCQF level 4 is available through colleges and training providers. It has been designed to be delivered as a taught course and will normally be available as a combination of practical activities delivered in training or production kitchens and sessions covering underpinning knowledge. The Culinary Ability: Food Preparation Award at SCQF level 4 has been developed in partnership with employers and industry and is intended to address the gap for kitchen staff with the relevant skills to carry out a range of basic tasks to a high standard. The unit-based structure aids timetable flexibility. This qualification can be delivered on a full-time, part-time or day release basis. This award also provides progression routes to further study (see Progression). The award is aimed at those of all abilities who have no formal qualifications in catering or hospitality but who are interested in, and motivated to pursue, a career in the sector. The units in the Culinary Ability: Food Preparation Award have been mapped against the National Occupational Standards for Professional Cookery. Completion of the award will provide learners with a platform to progress to other qualifications, for example SVQs in Food Preparation and Cooking or a National Progression Award in Professional Cookery; or to seek entry-level employment in the catering and hospitality industry, eg as a kitchen assistant. Ongoing course assessment will apply. Integration of assessment is encouraged. Assessment will allow candidates to enhance their own practice and develop their technical skills.